Hipólito Lázaro was born in Barcelona, Spain, on the 13th or 14th of December 1887. He received no formal education in singing as a young boy, although nourishing a great interest for singing and a desire to sing. The great musical enthusiasm in his village also provided the encouragement needed to keep singing and when in 1905, at the age of 18, he had the chance to sing in two local performances of Arrietas’ Marina and Vivas’ Bohemios, both fairly demanding vocally, he was convinced into taking it up seriously and started vocal lessons with maestro Blanch. He was subsequently sent to the front in the Spanish-Moroccan war (1909-11), where he played saxophone in a Soldiers’ chapel. Upon his return in 1910, at the age of 23, he made his professional debut at the Teatro de Novedades in Barcelona in Donizetti’s La Favorita, followed by Rigoletto, L’Africana, Trovatore, Carmen and Aida in Valencia and Tosca in Palma de Mallorca. This yielded no immediate success, however, and some sources point to Lázaro’s lack of formal vocal education. He had a poor technique, or so he felt, and he moved to Milano the same year in order to study and to improve, preparing his repertoire under the reputable Enrico Cotti. His Italian debut came late 1910 in Rigoletto at the Teatro Tosi-Borghi in Ferrara. 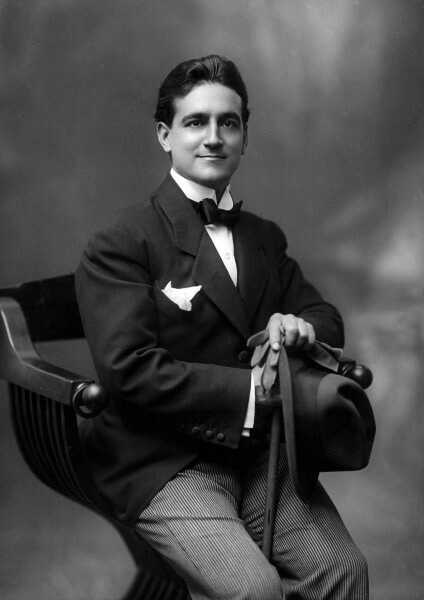 During the summer of 1911 he appeared in a series of concerts held in England as Antonio Manuele, an artistic name he most likely assumed in order to break into the world of Italian opera. In England he also made his first recordings for HMV. He also appeared that year in Egypt at theaters in Cairo, Alexandria, Port Said and Brumate. Lázaro’s career was launched, largely due to the performances of La Boheme at the Teatro dal Verme in Milano in June 1911, Rigoletto at the Teatro Costanzi in Rome in December 1911, where he stepped in for an indisposed Alessandro Bonci, and Mascagni’s Isabeau in Genova’s Teatro Carlo Felice in January 1913, conducted by Mascagni himself. Lázaro’s appearance in Isabeau created a vast impression on Mascagni, who in the years to follow held him to be his favourite tenor, and wanted him for the part of Ugo in the world premier of his Parisina, staged on the 15th December 1913 at Milano’s La Scala. He was also called to Livorno for 15 performances of Isabeau, and once more at the Costanzi of Rome in 1914 for the composer’s Parisina and Iris. As Mascagni’s protegée, Lázaro received clamorous success in Italy, and critics compared his voice to the legendary Giovanni Battista Rubini (1794-1854) for its metallic shine. Mascagni admired Lázaro for his stamina and for his fearless undertaking of taxing and harmful tessitura. His approach to Mascagni’s characters was passionate and temperamental, leaving Lázaro one of the prime verismo interpreters of his time. After the first appearances in Mascagni’s operas, Lázaro assumed a series of verismo operas to his repertoire, including Puccini’s La Fanciulla del West (Buenos Aires, June 1914), Manon Lescaut (Buenos Aires July 1915) and Madama Butterfly (New York April 1920), Leoncavallo’s Pagliacci (Habana January 1917) and Mascagni’s own Iris (Alexandria, February 1912), Parisina (Milano, December 1913), Isabeau (Genova, March 1913) and Cavalleria Rusticana (Rio de Janeiro July 1914). He even attempted to sing Wagner: Rio de Janeiro saw his first Tannhäuser in August 1914. In April 1915 he sang in the premiere of Romani’s Fedra at the Costanzi of Rome, the lead which had been created for Lázaro. It was also the year in which de debuted in I Puritani in Porto Alegre, as Lord Talbot, a role that were to become one of his hallmark roles. It was later to be his largest success during his years at the Met (1918-20), and he first sang it on 18 February 1918, just after having made his debut with the house as the Duke in Rigoletto. For the remainder of his stay at the Met he was by and large overshadowed by Caruso, who had a firm grip on most of the lyrical-spinto repertory at the opera in New York. He was yet again Mascagni’s tenor on 2 May 1921, when the world premiere of Il Piccolo Marat took place at the Teatro Costanzi in Rome. Lázaro sang the leading tenor, Marat, a part that had been created for him. From 1921 and onwards Lázaro appeared in a large number of stagings of Aida, becoming a respected and appreciated Rhadames. His repertoire also tended towards Il Trovatore, L’Africana and Gli Ugonotti, operas which were to characterize the latter part of his career, along with the Spanish zarzuela, Arrieta’s “Marina” in particular. The presence and popularity of Miguel Fleta, who had assumed many of Lázaros roles, partly forced through the change of repertoire. While in Philadelphia in 1924, he received a letter from Giordano who was writing on his next opera, La Cena delle Beffe, asking him to create the tenor role. The premiere was held in December 1924 at La Scala with Lázaro, under the baton of Toscanini. The second part of Lázaro’s career, stretching from the mid 20’s to his retirement in 1950, was comprised of concerts and performances held within Spain, France (Paris) and Italy, apart from his varoius trips to South America and in particular Cuba. His repertoire was becoming narrower and narrower from the 30’s and onwards, and the voice showed clear signs of decline. Yet he conserved some of his glory and acclaim through the zarzuela. During the 30’s he performed in La Dolores, Curro Vargas, Doña Francisquita, La Tempestad and starred in the premieres of Vive’s Euda d’Uriach (1934) and Gaig’s El Estudiante de Salamanca (1935). His prime zarzuela part was in Arrieta’s Marina, though, which he recorded in 1929. Lázaro’s career ended in La Habana, Cuba, 1950, with the performances of Marina, Aida and Rigoletto. He died 24 years later in his native Barcelona, on May 14th 1974, at the age of 87.